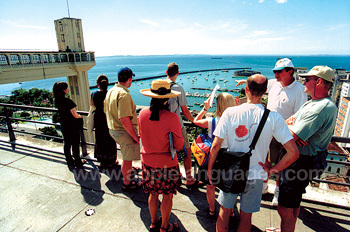 Salvador da Bahia is a fantastic place to learn Portuguese on a language course abroad. 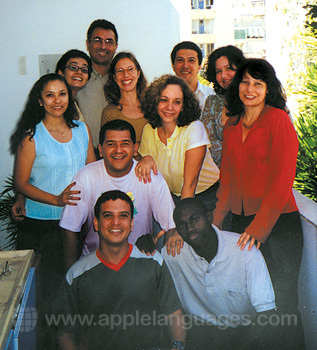 The Brazilian people are extremely friendly and happy to speak Portuguese with those who study at our school. Salvador da Bahia offers a great mix of the old and new Brazilian city, with its superb beaches and the warm Brazilian culture. 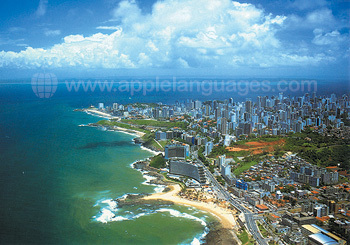 Capital of the Bahia region, and former capital of Brazil, it is a fantastic place to study Portuguese in Brazil and offers something for all those wishing to learn the Portuguese language. In Salvador da Bahia, Brazil, you can study Portuguese and also enjoy the rich and vibrant Brazilian lifestyle and heritage. Our school in Salvador da Bahia is ideally located, just a short walk from the beach and has excellent facilities, with air-conditioned classrooms, a large outside patio and free Internet access. 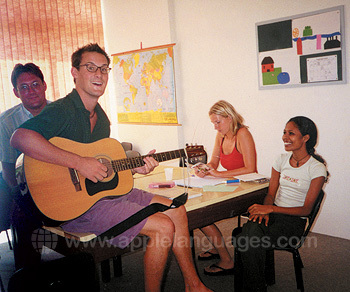 At our school in Salvador da Bahia you can learn Portuguese on a ‘Standard’ Portuguese course of 20 lessons/week, as well as an ‘Intensive’ Portuguese course, with 30 Portuguese lessons/week. 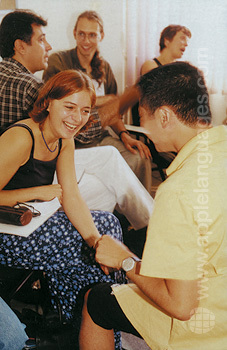 Or, you can study Portuguese on a ‘Total Immersion’ Portuguese course of 20 or 30 private Portuguese lessons/week, which is perfect if you need to learn as much Portuguese as possible in a short period of time, or if you want to study Portuguese for a particular purpose – such as Portuguese for Business Purposes. 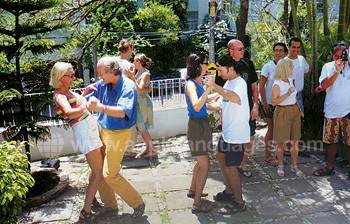 Our school also offers a ‘Brazilian cuisine’ course, ‘Samba and Brazilian Dance’ course, as well as a ‘Brazilian Music’ course – so you can learn to Samba as well as study Portuguese! Our school in Salvador da Bahia arranges accommodation in carefully selected Brazilian host families, as well as in hotels and guest houses. 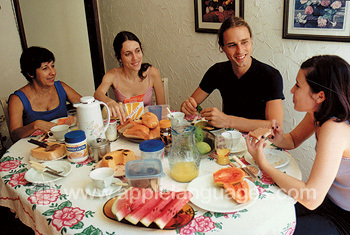 Naturally, if you live with a Brazilian host family, you will learn Portuguese faster, getting lots of extra language practise, as you speak Portuguese with the family. The lively activities programme offered by our school in Salvador Da Bahia will really help you to discover the rich Brazilian culture! Take lessons in samba or Capoeira, visit local places of interest, take part in soccer games or get involved in intercultural exchanges with local Brazilians! The activities are all optional and our colleagues at the school will confirm to you on arrival the exact activities offered during your stay. Our school in Salvador da Bahia, arranges airport transfers from Salvador da Bahia Airport, so that students can be met on arrival and taken to their accommodation. Average score for our school in Salvador da Bahia based on 23 previous client reviews. The course was very interesting and Milene, our teacher, was very professional and a lovely person. My host-family was very friendly, the room was simple but clean and nice arranged. The course was fantastic. Pitched at just the right level and with the right number of students. The work was challenging but at the same time relaxed. The teachers were excellent and very professional. From the first day I enrolled in the school in Salvador, everything was fine. All the other students were really nice and I made a lot of new friends. The staff at the school were always very friendly and helpful. 2 weeks just flew by and my Portuguese did improve! The whole experience was fantastic, I'm already considering another language holiday somewhere else! The course was interesting but a bit too intensive. Next time I would only take lessons in the morning. My host family was very friendly and nice. I had the best time. The course was good. We stayed there for only a week. I was placed in an advanced level and the teacher was dynamic and engaging. We went to a B & B we saw in Airbnb which was near the school. It was great. My wife was placed in a beginners level, and since no other student was there for that level, she got private classes. That seemed great; however, the [school's] policy is that if you take private classes you only get 1,5 hours of class. Since we had signed for 3 hour classes my wife felt cheated of half her class time in Salvador. 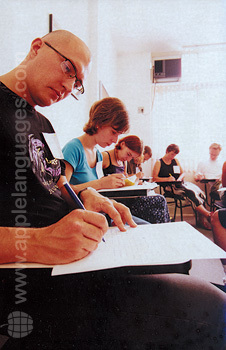 Overall the course was useful and inspired me to peruse more Portuguese classes in the future. Basic grammar training was very good. 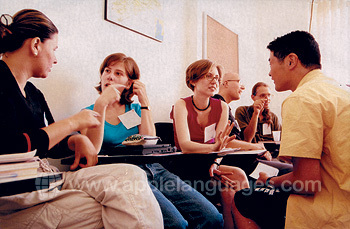 I was in a small group (3 pupils) and a teacher, it was really clear and the teacher was very helpful. The host family was very nice, my room was clean. Breakfast and dinner were really good. The accommodation was perfectly located, close to the school and the beach. Very high quality lessons which were just the right level of difficulty, interest and balance for my needs. Very friendly and professional staff. Very friendly and professional staff, great facilities and food. This was a youth hostel very good for meeting other travellers and Brazilian tourists. The course was very interesting and well organized. All of the teachers were nice and professional but also very friendly at the same time, they were able to create a nice atmosphere during our classes. I especially appreciated the fact that the number of students per class was limited to nine. I liked my accomodation, it was nice and the family I lived with was openminded, kind and fiendly. The course was well structured and presented, with a large number of instructors which gave them the flexibility to group students of similar levels. I thoroughly enjoyed the course and hope to return again in the future. My Portuguese course in Salvador de Bahia was very good. The integration was very good and we learned a lot in two weeks. The host family I stay was very good to me, they treated me like family. I was very happy with the trip, because I could make new friends from other countries far from mine, I recommend it! Salvador de Bahia is a beautiful city, its history is ancient and the sea is amazing! The courses and the teachers were good and the accommodation was clean.